Kourtney Kardashian and Scott Disick Visit The Everglades Safari Park With Son Mason! 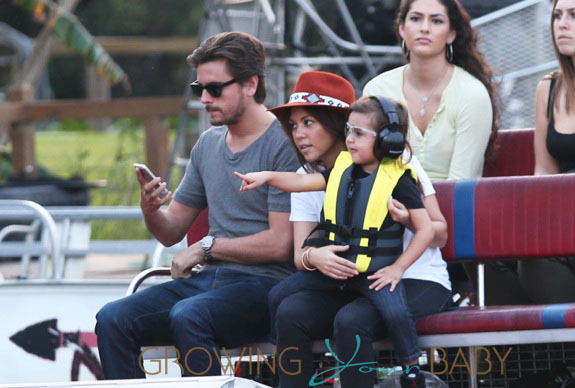 Home » Kourtney Kardashian and Scott Disick Visit The Everglades Safari Park With Son Mason! Ahead of his third birthday, Kourtney Kardashian and a Scott Disick treated their son Mason to a visit to the Everglades National Park for an afternoon of fun on Tuesday(December 11). While filming their show, Kim and Kourtney take Miami, the family went on an air boat ride and walked around the park checking out alligators and birds. During his ride through the everglades, Mason wore a pair of headphones while excitedly pointing out creatures in the water. After they finished, Kourtney shared a video of herself holding a baby alligator.